Colorado Springs Bulls’ Jason Harbison brings the ball downcourt during a Special Olympics Exhibition Game against the Colorado Springs Hoopsters at Peyton High School. 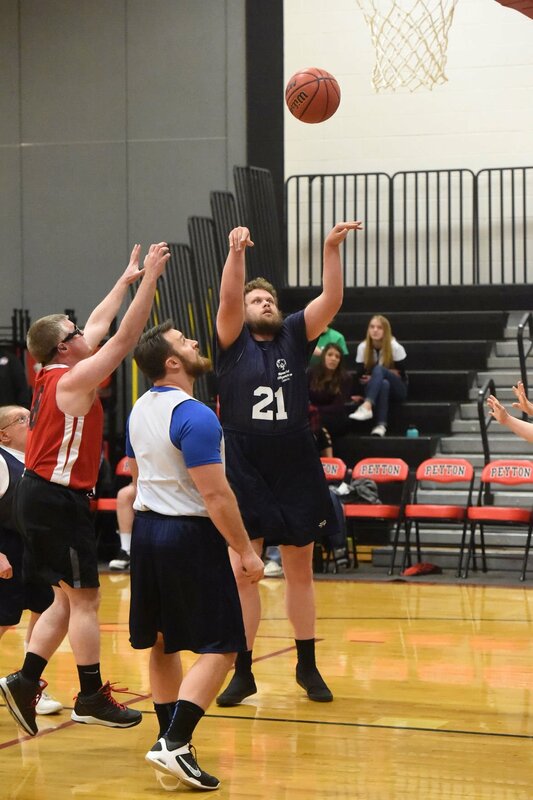 The Colorado Springs Bulls play the Colorado Springs Hoopsters in a Special Olympics Exhibition Game at Peyton High School Saturday January 12, 2019. Photo by Jeff Kearney. Colorado Springs Bulls player, Jason Harbison (22), looks for an open teammate during the Special Olympics Exhibition Game against the Colorado Springs Hoopsters at Peyton High School Saturday January 12, 2019. Photo by Jeff Kearney. 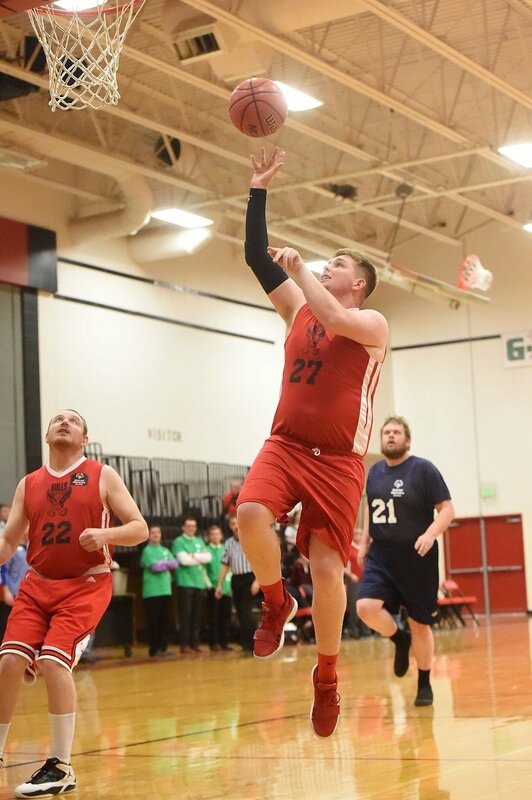 Colorado Springs Bulls player, Robert Shepherd (27), brings the ball in for a layup during the Special Olympics Exhibition Game against the Colorado Springs Hoopsters at Peyton High School Saturday January 12, 2019. Photo by Jeff Kearney. 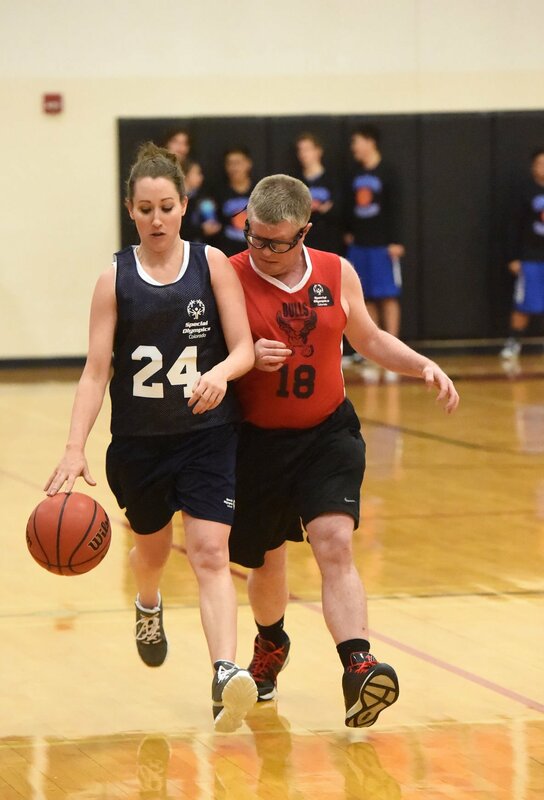 Colorado Springs Hoopster, Natalie Lang (30), steals the ball from a Colorado Springs Bull during the Special Olympics Exhibition Game at Peyton High School Saturday January 12, 2019. Photo by Jeff Kearney. Colorado Springs Hoopster Ritchie Cole scores during a Special Olympics game Saturday against the Bulls. Colorado Springs Hoopster, Ritchie Cole (21), grabs the rebound during the Special Olympics Exhibition Game against the Colorado Springs Bulls at Peyton High School Saturday January 12, 2019. Photo by Jeff Kearney. Colorado Springs Hoopster, Ritchie Cole (21), puts 2 points up during the Special Olympics Exhibition Game against the Colorado Springs Bulls at Peyton High School Saturday January 12, 2019. Photo by Jeff Kearney. In between games that had an impact on the 2A Black Forest League standings, Colorado Springs School and foe Peyton sat back, cheered and gained a perspective on how good they have it by watching a tilt that had just as much of an impact, regardless of the outcome. That was the mission of Peyton's second event to promote Special Olympics of Colorado that was highlighted by an exhibition game between the two prep contests. "The kids really embraced it, and they understand there's bigger stuff than just the basketball season," fourth-year Peyton boys' coach Jedd Sims said. "It was fun. The kids had a blast cheering on the athletes, and the athletes had a really good time. It was a win-win situation." More than $400 was raised for the program, Sims said. Sims gained that perspective while coaching prep basketball in Poughkeepsie, N.Y., and brought that concept to the Pikes Peak region. "Back when I was in coaching in New York, we did it every year, and last year was our first attempt in Colorado," Sims said. "We're trying to grow it and raise awareness. I think, overall, Special Olympics is like a forgotten thing. Our job is to make sure people know it's out here, and they can donate and volunteer." Starting Friday and running through Feb. 26, the color pink will work it way into the gyms across the Pikes Peak region. From whistles, jerseys and even hair, officials will go all-out when the "Officials vs. Cancer" campaign gets under way this week. On Friday, the Lewis-Palmer boys' basketball team will don pink jerseys in its Pikes Peak Athletic Conference game against Air Academy, said Gary Montel, a Colorado Springs official who has become the state's chairman for the annual event held during the third full week of January action. Montel, a member of the Colorado Springs Basketball Officials Association, said the organization has raised more than $365,000 in the last 10 years. During the 2018 campaign, approximately 1,100 officials statewide took part to help raise a five-figure donation to fight the disease. Just look for the pink bucket at games throughout the area. It's been a tough start for a Rampart boys' basketball program that had very little experience heading into this season. But after dropping nine of 10, the Rams put it all together Thursday in a 74-68 win over Valor Christian at the Rampart Holiday Classic. "We played hard that game and put together a really good fourth quarter," fifth-year Rams coach J'on St. Clair said. "That was the difference. We scored 32 points and erased a 14-point deficit. That was the key as we put both offensively and defensively a good quarter to pull off the win." Although the Rams (2-11, 0-3 5A Colorado Springs Metro League) lost their next two games against Pine Creek and Pueblo West, St. Clair sees a bright future on a team that features four sophomores and one junior to go along with six seniors. "It's not too late to turn things around," St. Clair said. "We had to figure out who we were, and I anticipate us to play better in our league games and hopefully get a few more wins." Nick Lave, a Colorado Springs official who called games at the prep and collegiate levels for more than four decades, recently called it a career. He took off his jersey for the final time Jan. 3 after working the boys' basketball game between Lewis-Palmer and Chaparral. "I'm 65, and it's always nice to go out on your own terms," Lave said. "I believe I still have the ability, to a point, but I'd rather go out while I'm comfortable rather than not being mentally and physically able to do it." A native of Florence, Lave moved to Colorado Springs in the late 1970s after receiving an internship with Colorado Springs Parks, Recreation and Cultural Services upon earning his undergraduate degree from the University of Northern Colorado. He spent 33 years with the city before retiring in 2009. His officiating journey took him through many sports, but he eventually specialized in football and basketball. He spent more than a dozen years in the Big 12 Conference and was part of the crew that called the Chick-Fil-A Peach Bowl on Dec. 29 in Atlanta. He also worked football and basketball games for the Rocky Mountain Athletic Conference.